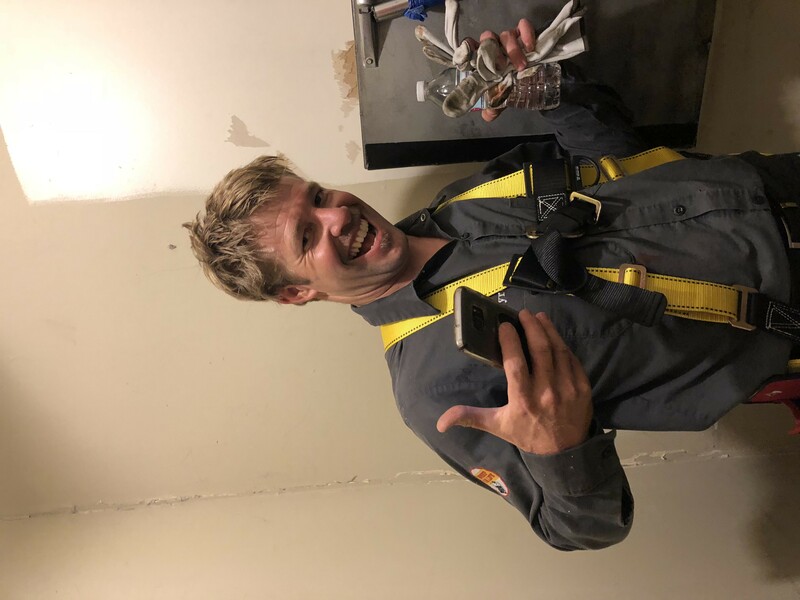 How do you repair a tall building laundry chute? I am a chimney sweep and I was contacted by a Hotel that had a laundry chute issue. They needed me to remove laundry and discover the problem. I removed laundry from 19' down the chute to 42' down which was estimated to be 4800 lbs of material. The original backup was twice as much. I found the issue was the chute is separated at 42' below the access point. The company is interested in repairing the separation without opening a wall. The chute is 28" across. I made a access ladder from connecting two household escape ladders and used a tie off harness system to enter the chute. The separation is 12". All seams on the unit are fitted male end down to prevent hangups. Interior walls must be free of edges that could catch laundry. I forgot to add, the separation is 40' above the basement dump spot. Can you put a spacer made of polyethylene sheets (laundry won’t stick to this) in the gap. Polyethylene can stand freezing temperatures without cracking. How do these secure to the upper section? The chute is encased in concrete block and firewall inside so freezing is not an issue. If the chute is made of any sheet metal self tapping screws can be used to fix the polythene sheets to the chute. Countersunk screws will not project. The repair material need not be only polyethylene. Even sheets of the same material now used for the chute can be used. We did finish the job. Sheet metal was used with pop rivets. We pulled the metal, which was very flexible, into a cylinder and secured it with tape from the inside. This was because once lowered we wouldn’t be able to reach around or through to cut tape that wrapped around the cylinder. We pulled the ladder up and threaded it through the cylinder and lowered it a few steps. Then my buddy climbed through the cylinder to be under it as both he and the cylinder were lowered. He had to flex the ladder to reach around and push the metal into the gap. The edge is not aligned because being inside the bottom and outside the top forced a cone shape.